Good news, Zip-N-Squeeze bags are back on the market. We are in the process of re-adding them to our site and hope to have them soon. Please contact us for more information. 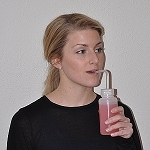 Zip-n-Squeeze bags are a squeezable bag with an attached straw to simplify and ease eating and drinking for patients post-jaw surgery, or with head and neck cancer, oral-facial muscle weakness, and wired jaws. We currently do not have a replacement for the "Healing Jaw" Guidebook. 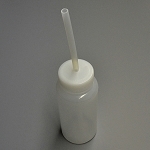 Looking for the Soft-Sipp Bottles, try these NutriSqueeze bottles with a soft spout for patients with a cleft lip. 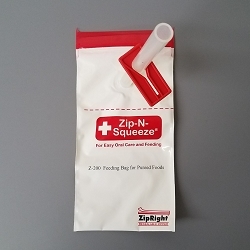 Looking for Zip-n-Squeeze, ZNS, Zip and Squeeze bags or guidebook?